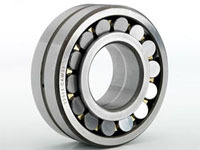 Spherical roller bearings with two rows of rollers, the main path of a load to bear, but also can withstand axial load in either direction. A high radial load capacity, especially suitable for heavy work loads or vibration, but can not be subject to pure axial load. This kind of bearing outer ring raceway is spherical shape, so the good performance of its self-aligning, can compensate concentricity error.